This concept has been proposed by the 1984 Nobel prizewinner C. Rubbia, in 1998 during a CERN lecture. The very first suggestion of using fission fragments to directly heat rocket propellant was made in 1948 [Shepherd and Cleaver, 1948]. Quite independently, the same idea was also investigated in Israel by Professor Y. Ronen at Ben-Gurion University [Ronen, 2000]. In Italy this concept has been developed since 1998 by an ad hoc research team led by C. Rubbia and funded by the Italian Space Agency, ASI. A preliminary feasibility report described the main features of this engine concept as of March 1999 [Augelli et al., 1999]. The Rubbia engine differs considerably from all the NTR concepts above in that the heat transfer strategy of Section 7.5 is reversed. In Rubbia's engine, a fissioning surface layer, deposited on the inside wall of the reactor chamber, emits isotropically fission fragments. Because of the size of the reactor and of the nature of the fuel proposed (the mestable isotope 242mAm) the fissioning layer may be very thin. 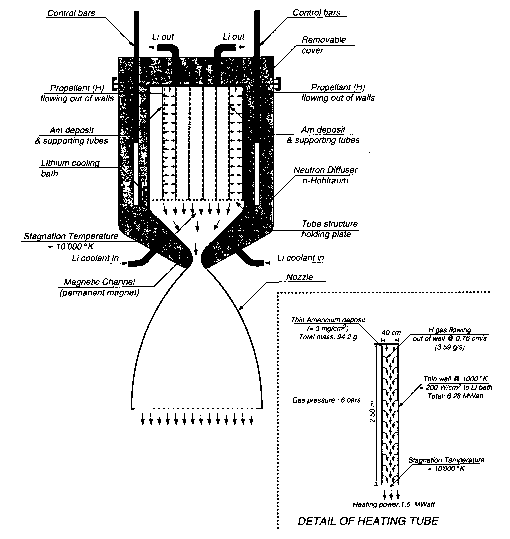 Provided it can be kept at a reasonably low T, about half of the fragments released from the fissioning layer are injected directly into propellant pumped into the engine (hydrogen). The fragments thermalize inside the propellant, that is, redistribute their kinetic energy (up to 200 MeV) by collisions with molecules of hydrogen, raising its temperature up to 8,000-15,000 K. Because of their isotropic emission, the fission fragments not ending inside the propellant deposit energy inside the reactor walls, so cooling the walls coated with fissioning fuel is critical. In this concept the propellant may become hotter than the solid walls, overcoming the temperature limitations of wall materials. In principle, this concept should result in a simpler (and lighter) nuclear propulsion system. Provided radiative heat transfer from the hot hydrogen plasma is moderate, the Isp of this concept may be much higher than for the solid-core NTR already discussed: propellant temperature is higher, and at higher temperature hydrogen is nearly completely dissociated into H atoms, lighter than H2 molecules by a factor of 2. In fact, at chamber temperature of order 10,000 K the Isp calculated is about 2500 s.
This concept enables a Mars mission with a much smaller vehicle than at present being envisaged with either chemical propulsion or conventional (solid-core) NTR. 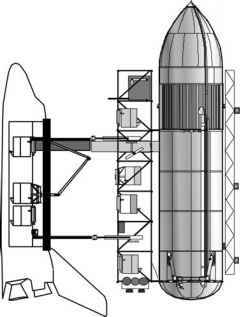 If propellant temperature could reach 16,000 K the work already done by the ASI team indicates a Mars mission vehicle could weigh «120 tons. This would also result in a Mars round-trip time slightly more than a year, including 40 days on Mars' surface. Thus the space radiation dose to the crew would drop from the 60-120 rem estimated for the NASA Mars Reference Mission Version 3.0, lasting some 2.5 years [Drake, 1998], to a much lower 45 rem, including the radiation dose from the NTR itself [Lawrence et al., 1995, Table 8.1]. In fact, most of the radiation in a long Mars mission is due to galactic sources and solar flares, and is proportional to round-trip time (for an explanation of the radiation dose and of the rem unit see Appendix A). According to the information released in the fall of 1998 at CERN, a preliminary estimate for this concept had a mass/power ratio = 1.25kg/kW, about 10 times larger than conventional NTR. Weight and size, however, are a function of engine operating pressure, which was assumed to be 1 atm as a convenient yardstick at the time. 242m Am is the fission material of choice for this engine, one of the reasons being that criticality can never be reached: its neutron cross-section vs. temperature peaks and then falls to very low values, ensuring no runaway reaction may take place. This isotope is metastable and must be manufactured, for instance, from the 241Am used in all commercial smoke detectors; it is not weapon-grade material. Because 242mAm can never become critical, an external neutron source must be used to start fission. This can be accomplished using a proton (p+) accelerator and a high atomic mass target material (e.g., tungsten) target, where the impacting p+ beam produces a neutron shower. A non-standard way could use the compact neutron source available at atomic research laboratories in the former Soviet Union and capable of neutron fluxes ~ 1019s[Prelas, 1998]. The so-called "TARC" experiment of C. Rubbia at CERN showed that by enclosing the engine inside a graphite hohlraum (a cavity, behaving as a black body for neutrons), neutrons diffusion time and mean free path could be made long enough to sustain steady Am fission without an external source. 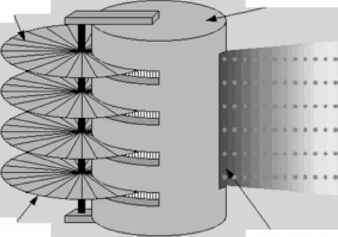 A conceptual sketch of this engine (see Figure 7.26) consists of a cavity (the "chamber", or reactor) where 242mAm is present as a layer deposited on the walls. Hydrogen is injected inside the chamber, for instance through wall holes. The Am layer fissions, saturating the chamber with high-energy fission fragments, the whole chamber being surrounded by a neutron flux-enhancing material, such as graphite constituting the so-called hohlraum as well as the shield. 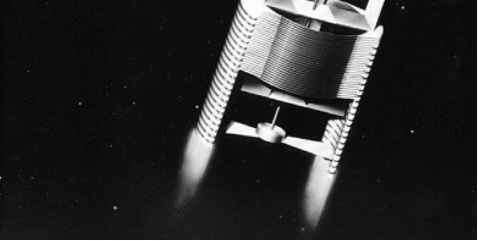 The hydrogen injected inside the chamber is bombarded by fragments from the fissioning fuel, and its temperature rises. The temperature reached is determined by the hydrogen flow-rate: the higher the flow-rate, the lower the temperature. Finally, expansion through a nozzle generates thrust. Hydrogen could be heated to extremely high temperatures in this process, because the kinetic energy of fission fragments is of order of 100 MeV; in practice, convective and radiative heat losses will eventually limit hydrogen temperature. Thrust depends on chamber pressure, size and neutron fluxes; thrust needed for a powered Mars mission depends also on the choice of trajectory. A preliminary "fast" mission with a single ship was calculated by the ASI research team in 1999. With thrust in the 1,500 to 2,500 N range, the round-trip mission time was 369 days, including 40 days spent on Mars' surface. Since this work was funded by ASI, details of the technical solutions proposed to solve the many physics and engineering problems encountered are still ASI property. What is publicly available indicates that this novel concept is viable (no show-stoppers), and would bypass many or most of past problems associated with conventional NTR, among them the large neutron fluxes generated during their operation. The very fact that Isp could be raised to a factor 2 to 4 above that of other NTR, and a factor 5 to 8 above that of LOX/LH2 rockets, is a powerful motivation to pursue this concept further. Figure 7.26. Diagram of a generic FF-heated Rubbia's engine. Details of one of the Am-coated tubes is shown in the inset. Cooling is by liquid lithium. Figure 7.27. A conceptual scheme of the operation of a thin filament. Figure 7.28. Artist's view of a filament fission-powered spacecraft. propellant. Accordingly, the thrust is also very low. An artist's view is sketched in Figures 7.27 and 7.28. Although intriguing, there are hardly any significant details in the information from LLNL to draw conclusions or even comments. Among the critical areas discernible at this early stage in Rubbia's engine concept are: the radiative heat loss and cooling of the reactor/chamber, the effect of chamber size (diameter) on criticality, nozzle design and operation, Americium procurement and production, fuel replacement, and certainly ground testing, a critical issue common to all the propulsion systems mentioned. Among the advantages of this novel concept is the fact that Am fission can never become critical, an important factor in public acceptance. A third appealing point is the relative simplicity of the reactor design and the potentially large Isp with a reasonably large thrust. What is the fuel of rubbia's engine?